I’ve been a little lax in writing the weekly blog. I have been working on a photography project for an exhibition that opens July 20 and I just learned that my project has already been done by another photographer. I am also making a film, by which I mean I have descended into a surreal world of jugglers, dogs that play poker and melting clocks where I spend my time pushing a massive piece of granite up a Teflon hill. 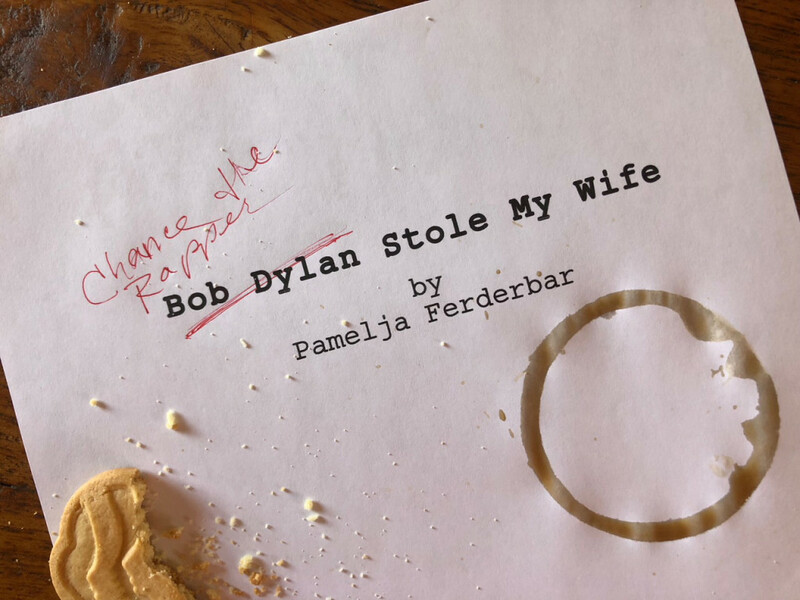 The film is from a script I wrote called Bob Dylan Stole My Wife, which is about a man who neglected his wife and when she doesn’t return from a Dylan concert where she was spotted getting into Bob’s tour bus, the hubby assumes the worst. He must join forces with a small town music critic who claims to know the bard, and who further asserts he can help get the dude’s missus back. The entire film takes place between Kewaskum, Wisconsin and Duluth, Minnesota—arguably the whitest swath of America this side of the Mason Dixon. Trying to raise the money to make the movie is like getting your first job out of college, or putting socks on an octopus. Investors want to know which stars will be in the movie before they pony up, but the stars want to see the money before they agree to be in the film. My producing partner and I figured we should start with a casting agent who could help us navigate this great divide. The first casting agent we contacted was in Los Angeles. He allegedly read the script before proffering tips as to how we might make the movie better. I spent a hundred years making TV commercials so perhaps I am unfamiliar with the wily ways of Hollywood. Even so, it seems forward and a bit presumptuous for someone whose job it is to find actors to fill a role written by a screenwriter to send the screenwriter “notes” about the screenplay particularly when the “notes” suggest a major retooling of the entire plot. Specifically, we were asked whether we might consider making the male leads lesbians, and if that was too “out there,” how ‘bout we make them black? In addition, he wanted to know whether we were married to the title Bob Dylan Stole My Wife because Chance the Rapper is on fire right now and Bob Dylan is sort of…yesterday. Oh, and could the story take place in the Bahamas? I’d give my right eye to work with Chiwetel Ejiofor, Jodie Foster or Chance the Rapper, and hailing from the fine state of Wisconsin I would relish the opportunity to spend a few months in a tropical paradise, but the reality is that I wrote a story about a clueless ostensibly tone deaf white dude in Kewaskum, Wisconsin who believes his wife to have run off with an aging, Nobel Prize winning, poet laureate of rock n roll. Next, I fully expect someone to suggest we animate the whole shebang with dwarf non-binary lobsters from Bed-Stuy who speak Italian because…Fellini. As I have often said about the process of having a book published, the writing is really the easy part. It’s all the crap that comes after that causes you to sweat. But we soldier on. This week we scored our first star for one of the supporting roles. Mind you, Bob Dylan Stole My Wife is what we call a buddy road pic so other than the leads, i.e. the buddies, the supporting roles are smaller, yet respectably well written and meaty. When the actress learned we planned to shoot in Wisconsin, which is not the same as Minnesota although almost equidistant from LA, she said she was “going to need more pages,” by which she meant she wants a larger role with more screen time. I can’t wait for the eight-year-old who plays a visually impaired altar boy to send us his contract rider. At this rate the movie should clock in at a tidy 9 hours. I apologize for being remiss in blogging especially when there is so much to say about gun violence, politicians who are bought literally lock, stock and barrel, boycotts and teenage revolutionaries, but I am swimming hard as I can just to keep this world of make believe afloat. Comparatively speaking, it’s not so bad being surrounded by jugglers, dogs that play poker and divas. Come to think of it…cue the lobsters. Miss Thing is ready for her close up.